AgLanta Academy is a workshop series for AgLanta Grows-A-Lot pilot teams (and public ) to learn, share best practices, and grow! 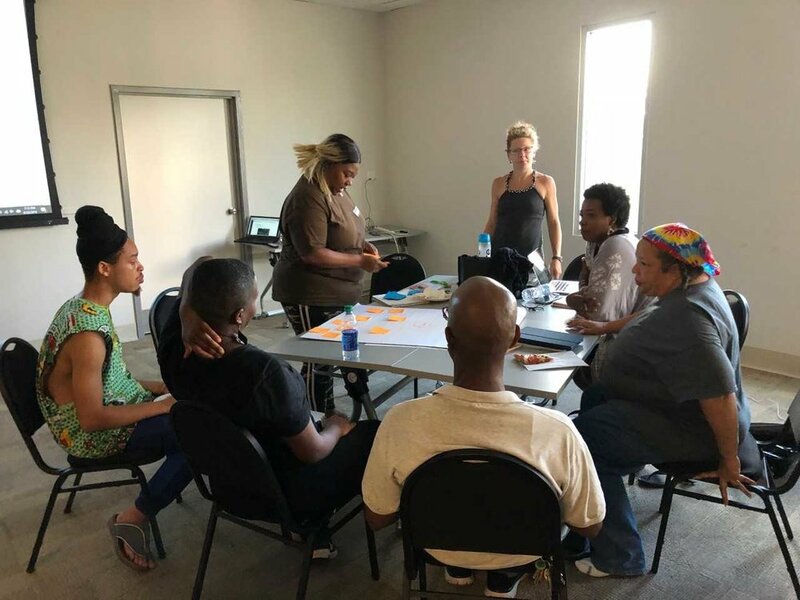 Please visit the Aglanta resource page to connect with additional urban agriculture training opportunities and partners in AgLanta. Where: Atlanta Community Food Bank: 970 Jefferson St. NW. (Please park on the side of the building.) . What: Please press the button below for Academy Agenda and power Point. When: Saturday June 30, 2018 (3:00-5:00 PM). IOBY filming 5:00 PM. Where: Atlanta Community Food Bank: 970 Jefferson St. NW. (Please park on the side of the building.) . Then Good Samaritan Hospital Farm. Academy Agenda and power point, and links to GrowVeg.com can be found by pressing the button below! Garden Team Work Stations: Teams rotate through two stations (3:00-3:30/ 3:30-4:00 PM). Team design presentations: Feedback all (4:00-4:20 PM). * Pre-academy site visit with Maurice, Fred, or Beak to prep site + stake phase one of site plan. (1/27, 2/3, 2/10 before Academy). Introductions: Pilot teams share their DRAFT Urban Garden Budgets - Funding/Donation Ideas for Phase 1 of your garden ( 2:00-2:45 PM). Power point: Crop Planning - planting calendar by month, Mother Jones Companion Planting Guide, Growveg.com tool (2:45-3:00 PM). Garden team work stations: Teams rotate between two stations (3:00 - 3:40 PM). Direct Sow/ Transplant Demo (3:00- 3:20 PM). Crop planning + Grow Veg! (3:20-3:40). Support & review for your 2018 crop plan: all (3:40-4:00 PM). Complete garden budget for phase 1 of your site plan. Apply for 1-2 grants on 2018 Grant Calendar, cultivate Sponsors, donations. Introductions: Urban garden team updates + celebrations (2:00-2:10 PM). Garden Team Work Station 1: Work on above (2:30-3:00 PM). Power Point: Planning your garden build event: date + checklist/resources (waivers, photo releases, resource list - materials etc.) (3:00-3:10 PM). * Credit for template is The Conservation Fund. Link to 2018 shared grant calendar and resource list can be accessed through garden managers. Garden Team Work Station 2: Plan garden build event + date + partners/team. Presentations: Date of garden build + next steps. Homework: Team planning + execution of your garden build event.